Keywords: History Teaching and Learning; Information and Communication Technology/ICT; Internet; Teaching and Learning Support Material/TLSM; Multimedia. Research by Mayer12 has revealed that "deeper learning is achieved when the following multimedia combinations are used: text and picture explanations rather than verbal explanations"; "exclusion of irrelevant words, sounds and video"; "avoidance of complex verbal and pictorial representations with no guidance for low-prior knowledge learners"13 and "words presented in a personalised conversational style, rather than a detailed description style".14 Mayer's cognitive theory of multimedia learning is validated by research findings by De Sousa,15 confirming that in History teaching and learning, constructive learning as active, outcome-oriented and self-regulated learning, with the aid of ICT and multimedia, resulted in good achievement by learners. This also shows that teaching styles can be changed to new constructive methods of teaching aided by ICT and multimedia. Elen and Louw16 believe that "additional media can be non-effective in learning". Furthermore, they are of the opinion that questions, figures and examples on a computer screen, among others, may have 'counter-productive effects if inadequately used by the learner and that "well-designed aid is not sufficient; it needs to be adequately used by a knowledgeable learner". This is where the history educator must scrutinise a source and decide whether the integration of a resource in teaching and learning is beneficial to the learner. On the other hand, Lee17 reports how History learners are "more accustomed to technological experiences in the web-based world of our time", how "digital historical resources make university learners return to the same documents time and again", and that learners rate visual media as most useful since it helps to visualise events. Mindful of the opinions noted above, scholars continue to argue that there is no definite answer to the common question as to whether ICT, in this case computers and the Internet, help to achieve 'better' learning and that interactive technologies do not automatically give good results.18 One can therefore address the following research question, namely: What sources and resources are available on the Internet that can be used to the benefit of History teaching and learning? The purpose of this article is to provide an applied and theoretical reference to resource materials that are available for History teachers on the Internet. The purpose of utilising sources and resource materials in History teaching and learning will be explained concisely. Lastly, examples of a variety of exciting electronic sources and resources to be found on the Internet are shown. The expected outcome is that teachers will access and make use of the sources and resources discussed in this article so that ICT can be integrated into History teaching and learning to the benefit of learners. Lee, Doolittle and Hicks21 have researched just how far teachers make use of the Internet. They found that History teachers make use of more non-digital historical primary sources in their lessons. The downfall is that sources that are used do not come from specialised websites that capture the historical milieu of the original document. However, those who do use digital historical primary sources are positive about the fact that access to such primary sources allows them to access previously unattainable sources, not to mention that these sources provide a valuable tool for comparison between sources, increase the variety of sources used in the lesson, and makes for a rich historical teaching and learning experience. Since learners of the 21st century in Africa are ICT skilled, History pedagogy must accommodate the learner accordingly, but until teachers themselves make use of the Internet, neither digital nor non-digital historical primary sources will have an impact on History teaching and learning. Bridging the digital divide between Africa and the developed world may lead to bridging the divide between the integration of ICT and multimedia resources into our pedagogy. A paradigm shift is also necessary for ITC in education to change and improve teaching and learning methods, since teachers use the Internet primarily for retrieving information. The ideal would be to integrate the Internet into the curriculum23, giving rise to new teaching and learning methods, which can ensure that purposeful use of the Internet will benefit learners who use resources thereby enabling them to think critically and be inventive. The inclusion of ICT in the national curriculum of South Africa has led to the integration of multimedia in teaching and learning, thus enhancing learning, provided by access to ICT resources. The purpose of integrating multimedia and the Internet in History teaching, among other disciplines, is to enable the obtaining of information in the form of documents, photographs, video, audio clips and virtual experiences as well as exposure to different points of view so that learners can construct their own knowledge24. Due to the nature of the discipline of History that deals with many sources, terminology found in primary sources is of such a nature that learners find it difficult to understand its content and meaning. Lee25 has suggested that a multimedia facility to record text sources and link unfamiliar words to a glossary, helps learners to understand better. The risk exists that the use of digital historical resources (e.g., primary source documents) in History teaching and learning can lead to information overload due to the large volumes of information and lack of organised structure on the medium of projection.26 Suggestions to counter this include the use of primary source documents to focus teaching and guide inquiry into historical problems, as well as to facilitate the application of knowledge and assess learners' learning. Researchers of History teaching and learning, debated that multimedia resources serves the purpose in the discipline of including a wide variety of resources, for example video, maps, photographs, timelines, etc. from which teaching and learning can take place. Multimedia resources, which are on-screen information sources, are technological experiences, which have been suggested to generate opposite reactions to reading traditional historical texts from books.27 The latter was evident in learners' ratings of film and video as the most useful, since it helped them to visualise events. Results also showed that the learners gained knowledge of the historical events presented in the resources. Mills28 is another believer of the use of the Internet and multimedia in teaching and learning. He recommends using the Internet to obtain interactive maps that can show changes during a time period and statistical information relating to historical sites. The Internet can also supplement a lesson, textbooks and encourages independent study. Furthermore, Mills uses multimedia technology to broaden the scope when teaching, thus requiring less note-taking by learners and more viewing of visuals that he believes is more stimulating for the learner. The Internet can facilitate familiarisation with information literacy in the form of written, archaeological, oral and audio-visual sources, so that the learner can "meet" the past. This can promote a comprehensive understanding of the past, empathy for decision-making, support interactive teaching, reinforce intellectual cognitive skills, and so facilitate learners to reach their full potential once these sources have been utilised. This will contribute towards ensuring that History teaching becomes a magical experience. 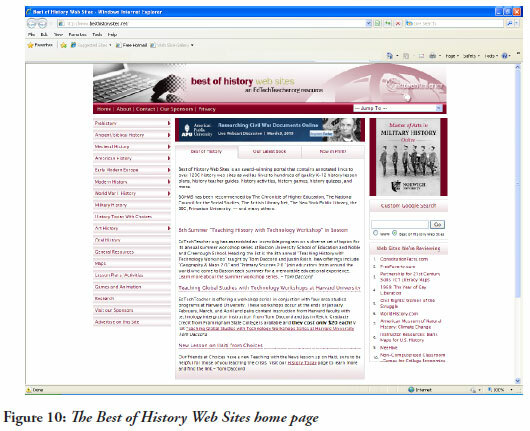 Despite the poor access and mixed attitudes to the use of computers in the humanities, which has had both a cause and effect on the slow use of computer technology for teaching and learning in History teaching,29 this article endeavours to probe Internet historical websites that are sources containing a wealth of information that can be used successfully in History teaching and learning. If the Internet and multimedia are available to instil a desire for learners to learn, then teachers must make use of it. The creators of the History Detectives website (cf. Figure 1) have used the 21st century social network Facebook (cf. Figure 2), now accessed by millions worldwide, to teach skills and get learners interested in History. 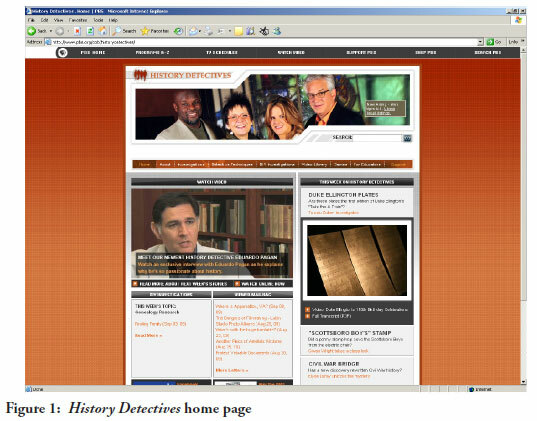 Even though its success has not been measured, the History Detectives website is not only interactive, but also includes lesson plans for teachers to introduce learners to the skills and techniques used in historical investigations. This site also has helpful guidelines on how to investigate ancient artefacts. 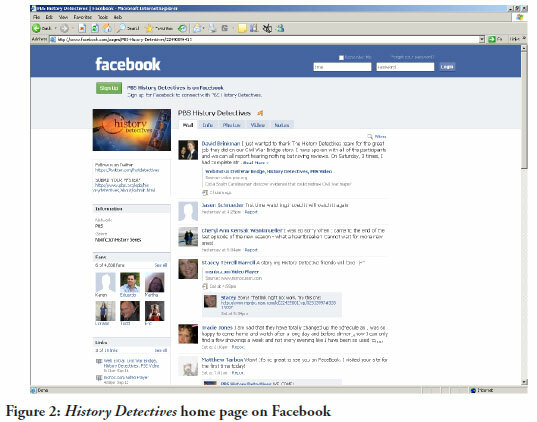 The website states: "History Detectives is devoted to exploring the complexities of historical mysteries, searching out the facts, myths and conundrums that connect local folklore, family legends and interesting objects. Traditional investigative techniques, modern technologies, and plenty of legwork are the tools the History Detectives team of experts uses to give new - and sometimes shocking - insights into our national history. The hosts of the program are a high-energy quartet of renowned experts in the world of historical investigations. Their expertise ranges from architecture, popular culture and sociology to archaeology, collectibles and genealogy"31 (History Detectives, 2009). History Detectives can be found at: http://www.pbs.org/opb/historydetectives/. Teachers need to ascertain the educational significance of teaching and learning with multimedia. For example, costs of hardware and software need to be taken into account. Teachers need to set aside time to find appropriate multimedia. Visuals, text, documentary excerpts and animations, among others, need to be collected and at times formatted before use. These are all time-consuming and require good planning and time management. Resources that are easily available to teachers for use in a classroom are, for example, computer software packages such as Britannica and Encarta Encyclopaedia on CD-ROM. These are usually released annually and stocked at major retailers. The package contains, among others, primary text excerpts, maps, multimedia, timelines, web links, two-dimensional virtual tours and statistics. Schools can contact Microsoft South Africa regarding a separate application for academic prices that can mean free use of some Microsoft software in public schools. 	The Sabinet (Southern African Bibliographic Information Network) site (cf. 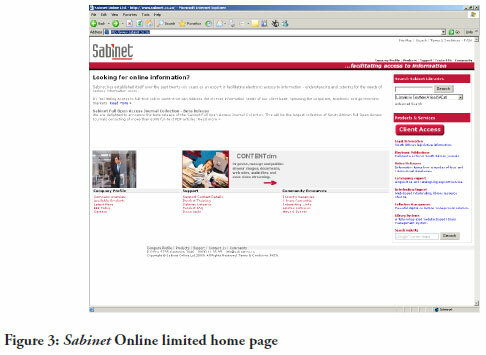 Figure 3) where on-line publications can be read at http://www.sabinet.co.za/. Sabinet is an expert in facilitating electronic access to full-text online information.  Sabinet hosts and maintains South African publications published online. 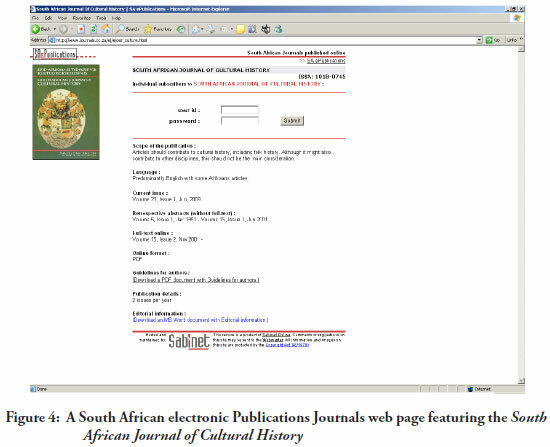 For example, the South African Journal of Cultural History (cf. Figure 4) contains scientifically researched articles of cultural historical significance. Subscription fees apply per annum with two issues published per year and this will give you access to read articles on-line at http://www.journals.co.za/ej/ejour_culture.html. This journal provides a wealth of knowledge regarding local historical events. The same applies to other History Journals like New Contree; the Transdisciplinary Journal; Historia and the South African Historical Journal. Teachers should exploit these journals extensively for valuable well-researched articles on topics they deal with in a classroom situation.  Ebsco Host (cf. 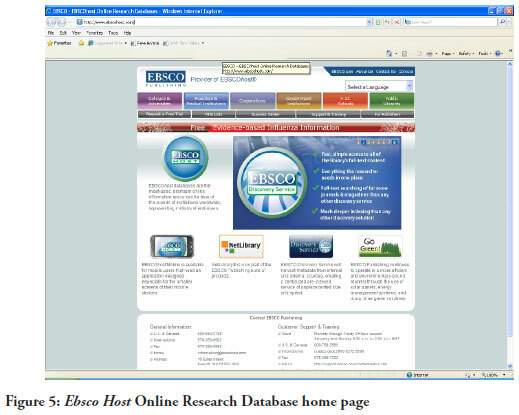 Figure 5) hosts many Historical Journals within the domain http://www.ebscohost.com. 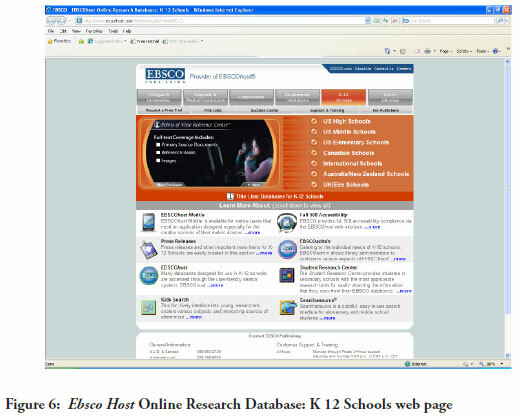 School teachers can make use of the research database service that caters for international schools with lists of databases for K-12 schools found within this Ebsco Host domain (cf. Figure 6) http://www.ebscohost.com/thisMarket.php?marketID=5. 	The South African Heritage Resource Agency (SAHRA) (cf. 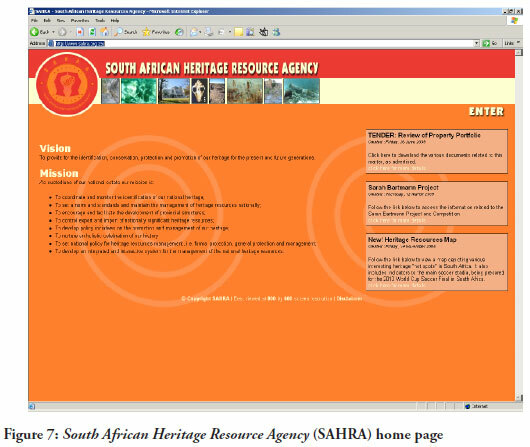 Figure 7), found at http://www.sahra.org.za/, can be contacted for resources as they safeguard South Africa's national heritage. The SAHRA library has access to the Internet. The web may be used to surf for topics, or librarians will search for a specific topic of interest. When topics of heritage and conservation-related information are found, they can be downloaded and distributed. This can be very helpful to teachers. 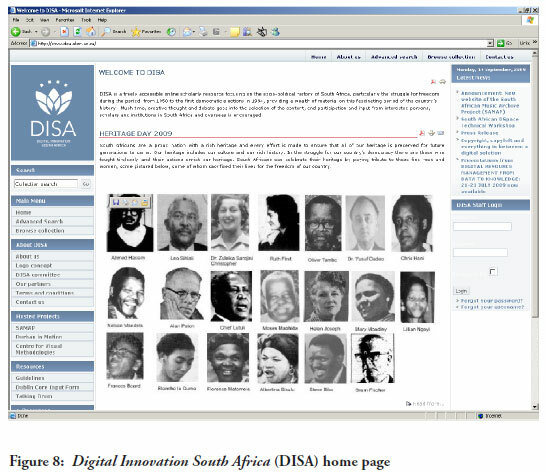 	The South African site DISA (Digital Innovation South Africa) (cf. Figure 8) is "a freely accessible online scholarly resource that focuses on the socio-political history of South Africa, particularly the struggle for freedom during the period from 1950 to the first democratic elections in 1994." It can be found at http://www.disa.ukzn.ac.za/. DISA is a national collaborative initiative that aims to make resources available and easily accessible on the WWW. The bank of high quality information resources contains historical material of importance and interest to scholars and learners. The huge collection of resources such as oral histories, articles, reports, videos, and interviews include, among others, the 1979 transcript of an interview with Helen Suzman, Colin Eglin and R Swart regarding the independence of the Ciskei and its socio-economic impact on black families, in pdf format. 	Teachers, parents and learners can all benefit from the free educational resources found on the SABC (website) (cf. 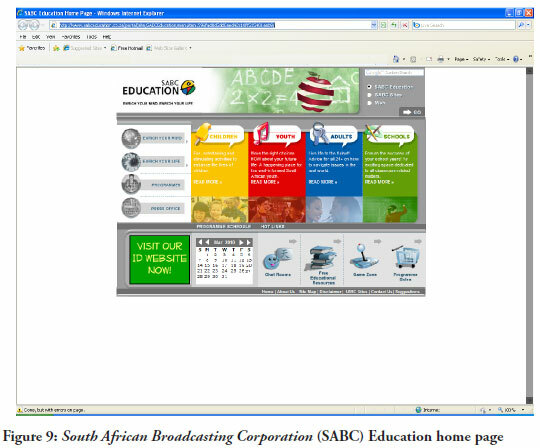 Figure 9) within the following domain: http://www.sabceducation.co.za/portal/site/SABCEducation/menuitem.596fad0d5dd8aed42c10ff535401aeb9/. Within this domain the SABC Education Outreach newsletter for teachers, parents and learners discusses, for example, Heritage Day and provides links to the SAHRA website. Activities and ideas are also suggested for lessons and are learning area-specific. Teachers can register and receive FREE information and updates at the following official domain: www.sabceducation.co.za. 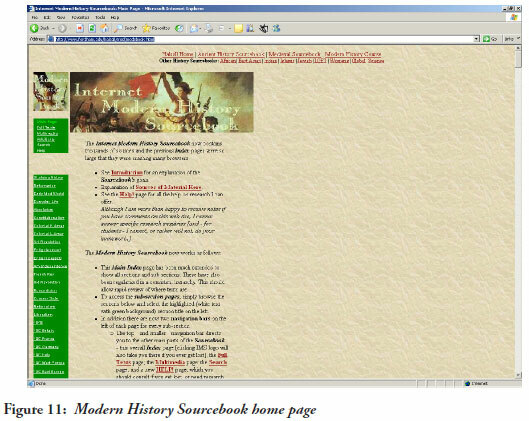  Modern History Sourcebook (cf. Figure 11) found at http://www.fordham.edu/halsall/mod/modsbook.html. This site contains full text and multimedia resources. It has a huge bank of themes (knowledge focus areas that are also covered in the NCS). Multimedia that can be accessed without delay includes images, maps, movies, music, national anthems, etc. The full text resources can be used in a lesson to set the scene and give background information. These resources link to other sites that further explore the topic. This site's main page is helpful to teachers who need more information on how to use primary sources or ideas for projects. 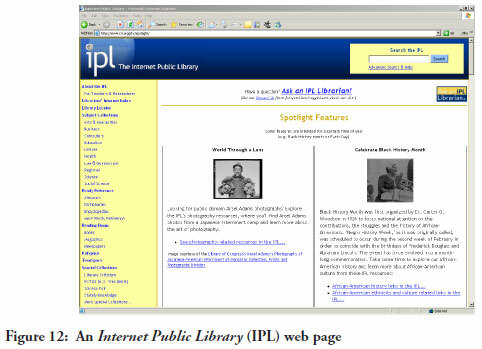 	In 2010 the Internet Public Library (IPL) (cf. Figure 12) will merge with the Librarians' Internet Index (LII) to create ipl2: Information You Can Trust. While the site will continue offering the same trusted resources and services, there will be several enhancements designed to give users greater access to the information. Resources that can be accessed via a link in this category include Eyewitness to History, Timelines of History, UNESCO World Heritage Centre, and the WWW VL History Index at http://vlib.iue.it/history/index.html. The latter is an index of Web resources, primarily for use by historians, history scholars, and learners. The index is further divided into categories, for example, Research: Methods and Materials, Eras and Epochs, Historical Topics, and Countries and Regions. The Countries and Regions section links to general resources about any country, both historical and non-historical.  You Tube (cf. Figure 13) contains visual and audio media that can be accessed for original footage of major events at http://www.youtube.com/watch?v=ZVDUXPB_sTs. 	The World History Sources website (cf. 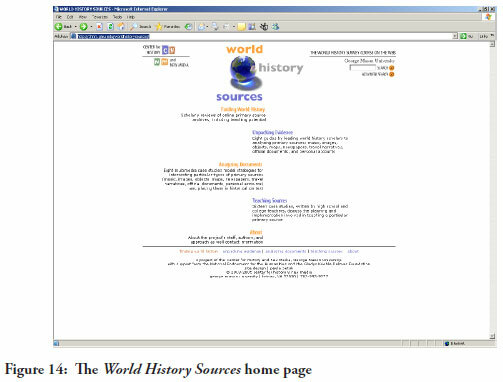 Figure 14), found at http://chnm.gmu.edu/worldhistorysources/, is a site centre for History and new media run by the George Mason University. It contains many sources pertaining to South African history. A bonus about this site is that its four areas of speciality: Finding World History; Unpacking Evidence; Analysing Documents; and Teaching Resources provide hands-on help to the teacher. For example, in the analysing documents section, multimedia case studies can be found that feature an expert interpreting different types of primary sources and explaining what can be learnt from each of them. The teaching resources section contains sixteen case studies compiled by high school teachers who discuss the planning and implementation involved in teaching a particular primary source. 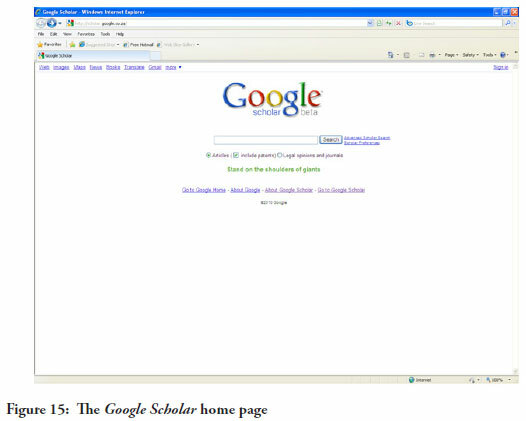 	The Google Scholar (cf. 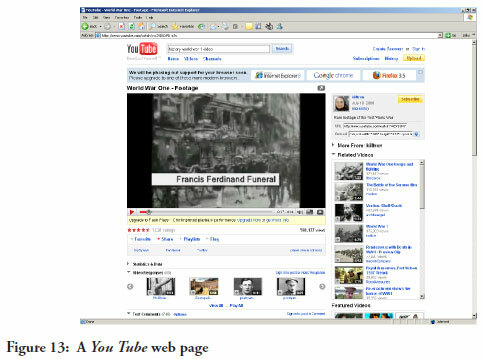 Figure 15) search engine has a relatively new site, www.scholar.google.com. It is for scholarly research and contains articles, books, etc. 	The Google for Educator home page (cf. 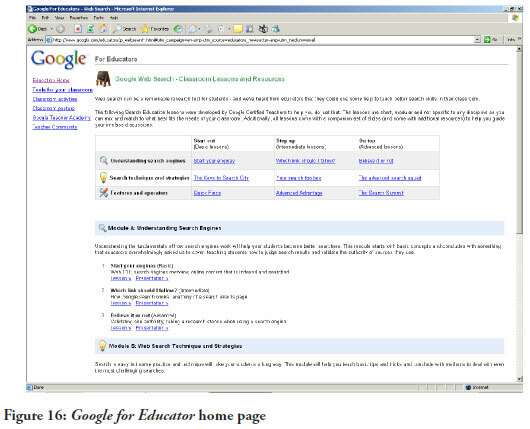 Figure 16), found at http://www.google.com/educators/p_websearch.html, is where teachers worldwide can subscribe to the Google Group's "Google Teacher Centre" and receive newsletters containing the newest information on technological advances. The latest newsletter states: "If you're just getting interested or started with Google Apps Education Edition, you may have a lot of questions. Like, 'How can I use these tools in my classroom, what are other schools/teachers doing, where can I find out the newest news about Google Apps, how have other teachers gotten their administrations to adopt Google Apps in their schools.' Well, we've got just the thing for you! To celebrate teachers and support Google Apps in the K-12 space, we've launched the Google Apps Education Community site at: http://edu.googleapps.com/. There you'll be able to watch tip videos, read our blogs and have forum discussions with your fellow teachers. We've also collected more than 20 classroom-ready lesson plans across at our Apps Education Resource Centre: www.google.com/apps/eduresources." A new help feature is available to assist teachers with searches. Three modular lessons, not specific to any discipline, come with presentations which will help guide a classroom discussion. Teachers will learn the fundamentals of search (which includes judging the validity of sources), search techniques and practices (for more advanced searches), and features and functionality (to learn some neat tips and tricks). A variety of resource materials and their location on the Internet for use in teaching European and South African history have been analysed. A theoretical reference to resource materials that are available for History teachers on the Internet as well as the purpose of using sources/resource materials in teaching and learning experiences has also been outlined. The greatest area of concern is not where to find the sources and resources, but how to access them in a third world country. In South Africa the problem of the lack of integration of ICT into teaching and learning still exists since the infrastructure necessary for Internet connections at schools is not readily available countrywide. Despite the way forward clearly marking a requirement for the integration of ICT into History teaching, the challenge faced is that a mind shift must be made by teachers to change their teaching and learning strategies and methods so that the integration of ICT, will not only lead to learning specific skills, but also to rather integrate multimedia resources into daily teaching and learning. The use of the Internet together with multimedia technology could be useful in History teaching to make the learning experience "magical." This includes, amongst others, more excitement, understanding, interpretation, analysis, commitment, and the drawing of relations between the "old" and the "new"; between the past and the present. 1 This reference to "movie makes magical" was a part of the 2009 SASHT conference theme. 2 Anon., "ICT. A definition from WhatIs.com", 2004 http://searchcio-midmarket.techtarget.com/sDefinition/0,,sid183_gci928405,00.html. Date of access: 14 February 2007 and Kent County Council, "What is ICT? ", 2004 http://www.kented.org.uk/ngfl/ict/definition.htm Date of access: 17 April 2007. 4 Anon, "ICT. A definition from WhatIs.com", 2004 http://searchcio-midmarket.techtarget.com/sDefinition/0,,sid183_gci928405,00.html Date of access: 14 February 2007. 5 Kent County Council, "What is ICT? ", 2004 http://www.kented.org.uk/ngfl/ict/definition.htm. Date of access: 17 April 2007. 6 Multimedia is defined broadly as the presentation of material in more than one form. When presenting material in teaching and learning it is referred to as multimedia instruction. Multimedia refers to presentations that include, among others, words (audio and printed text) and pictures (still and moving). See RE Mayer Multimedia learning, (Cambridge: Cambridge University Press, 2001) and AE Barron & GW Orwig, Multimedia technologies for training: An introduction (Englewood, Colo., Libraries Unlimited, 1995). 7 RG Weiner, "History: Teaching and methods", ERIC Document Reproduction Service No. ED 387 402, 1995. Accessed on 05 August 2005; ES van Eeden, Didactical guidelines for teaching history in a changing South Africa, (Potchefstroom: Keurkopie, 1999). 8 The cognitive theory of multimedia learning requires learners to 'hold corresponding visual and verbal representations in short-term memory concurrently.' See RE Mayer and R Moreno, "Nine ways to reduce cognitive load in multimedia learning", Education psychologist 38, 2003, pp. 43-52. It accepts that the human mind is a 'two-channel system of information processing with limited capacity'. It has visual/pictorial and verbal/auditory processing channels. See RE Mayer, "The promise of multimedia learning: Using the same instructional design methods across different media." Learning and instruction 13,2003,pp.125-139. 9 LO de Sousa, "The integration of Digital Video Discs (DVDs) and multimedia in the Learning Area Social Sciences", (MEd. Dissertation. North-West University, 2008). 10 SJ Howie, A Muller and A Paterson, Information and communication technologies in South African secondary schools, (Cape Town, HSRC Press, 2008). 11 GC Nugent, "Pictures, audio, and print: Symbolic representation and effect on learning". Educational communication and technology 30(3),1982,pp.163-174. 12 RE Mayer, "Cognitive theory and the design of multimedia instruction: An example of the two-way street between cognition and instruction." New directions for teaching and learning, 89,2002,pp.55-71. 13 R Moreno, "Decreasing cognitive load for novice students: Effects of explanatory versus corrective feedback in discovery-based multimedia.' Instructional science 32,2004,pp.99-113. 14 RE Mayer, Multimedia learning (Cambridge, Cambridge University Press, 2001). 15 Research findings as done by LO de Sousa, "The integration of Digital Video Discs (DVDs) and multimedia in the Learning Area Social Sciences", (MEd. Dissertation. North-West University, 2008). 16 J Elen and LP Louw, "The Instructional Functionality of Multiple Adjunct Aids", e-Journal of Instructional Science and Technology (e-JIST) 9 (2), 2006, available at: http://www.usq.edu.au/electpub/e-jist/docs/vol9_no2/default/htm. Accessed on 22/08/2008. 17 JK Lee, "Digital history in the history/social sciences classroom." The history teacher 35(4),2002,pp.503-517. 18 J Bernhard, "Thinking and learning through technology mediating tools and insights from philosophy of technology applied to science and engineering education." (In N Sanit, ed. The Pantaneto Forum, 2007), available at: http://www.pantaneto.co.uk/issue27/front27.htm as accessed on 22 August 2008. 19 C Gillard, "Better Teaching with Web Tools: How blogs, wikis, and podcasts are changing the classroom", May/June,23(3),2007, available at: http://www.hepg.org/hel/article/230, as accessed on 15 September 2009. 20 T Haydn, Information and communications technology in the history classroom (In J Arthur & R Phillips, eds. Issues in history teaching. London, Routledge, 2000). 21 JK Lee, PE Doolittle & D Hicks, "Social Studies and History Teachers' Uses of Non-Digital and Digital Historical Resources", Social Studies Research and Practice www.socstrp.org, 1(3)Winter,2006,pp.291-311. 22 CN Adeya, Information and Communication Technologies in Africa: A Review and Selective Annotated Bibliography, 1990-2000, International Network for the Availability of Scientific Publications (INASP) (Oxford, UK, 2001). 23 Research findings as done by T Tai, "A study of teacher usage of the Internet as preparation for developing information literacy in students." (MSc. Dissertation. University of Hong Kong, 2004). 24 ML Rice & EK Wilson, "How technology aids constructivism in the social studies classroom", Social studies, 90(1),1999,pp.1-6. 25 JK Lee, "Digital history in the history/social sciences classroom", The history teacher 35(4),2002,pp.503-517. 26 P Hillis, "Multi-media and history education: A partnership to enhance teaching and learning." Education media international, 39(3/4), September 2002,pp.307-315. 27 JK Lee, "Digital history in the history/social sciences classroom." The history teacher 35(4),2002,pp.503-517. 28 J Mills, "Teaching History and Government in a Multimedia Classroom", 1999, available at: http://www.midland.edu/~jmills/paper.html. 29 H Deacon, "Using computer technology in history teaching." South African historical journal, 38,May,1998,pp.3-19. 30 BA Ricketts, "Towards the Intranet: Schools Following the Trend." Education 6620, August, 1998, available at: http://www.pwc.k12.nf.ca/bricketts/e6620/intranets.html. 31 History Detectives, 2009, available at: http://www.pbs.org/opb/historydetectives/.